For two weeks, we booked four different hotels as we waited for the closing of the property we bought somewhere in Florida. 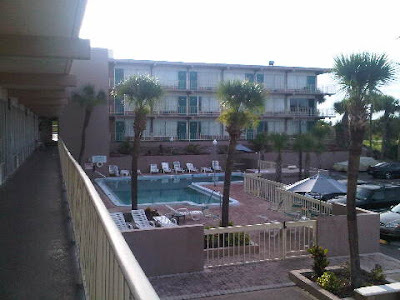 The picture below is the poolside in the hotel we checked in for a week stay in Cocoa Beach. This is the view when we are in our room. We never gets the chance to swim though because the weather is a scorcher. That is why, on the next hotel, we should dive in and enjoy the poolside. This is ECONO LODGE in 3220 N. Cocoa Blvd, (US 1) Cocoa 32926 phone: (321) 632-4561. This area is nearby Walmart, Publix and other major stores. It is also centrally located to every direction such as Merritt Island National Wildlife Refuge, Cocoa Beach, Port Canaveral, NASA (Kennedy Space Center) and Patrick Air Force Base. I definitely recommend this place. We only pay $32/day plus FREE hot breakfast. Not bad huh? Suggestion: Get a coupon in the rest area, call and compare what's in the coupon book. Sometimes, what the front desk tell you is cheaper than what's in the coupon book. Don't book online! If you travel to FLORIDA, get a coupon book on the rest area or tourist area, get a good deal at half a price. That is TRULY a good deal!